Thanks to a five point cushion in the rankings, last year’s US Open finalist, Karolina Pliskova sits at the top of a Slam draw sheet for the very first time in her career. Her first two tournaments as world number one were pretty solid with quarter-finals in Toronto and semi-finals in Cincy. First up for Pliskova in New York will be Magda Linette – Pliskova has won four of their five previous meetings in straight sets although they have only met once at the WTA main draw level. The first seed that Pliskova could meet is the number 27 seed, Zhang Shuai – the Chinese player looked decent in New Haven before pulling out of her quarter-final match against Elise Mertens with a right arm injury. Zhang opens against Sabine Lisicki, who has posted a 4-3 W-L record since her return from a shoulder injury. Snap Thoughts: Draw-wise, I think Pliskova is one of the winners. I can’t see anyone in this eighth causing her significant troubles through the first four rounds. Seeking to snap a four match losing streak extending back to Washington, the number 14 seed, Kristina Mladenovic will take on Monica Niculescu in the first round of the US Open. 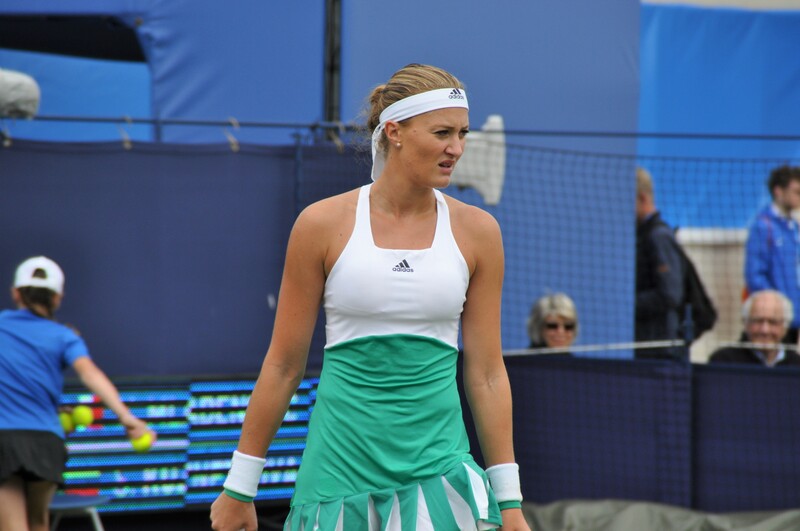 If Mladenovic was playing with confidence then she’d be the clear favourite in this match. However, this is clearly not the case, as demonstrated by a recent loss to former doubles partner, Timea Babos in New Haven. The Frenchwoman wobbled trying to serve out the second set with Babos going onto win, 7-5 7-5. While Mladenovic and Niculescu haven’t played since 2015, the Romanian player has won both previous encounters without dropping more than four games in the four sets they have played. The second seed in this section is the number 23 seed, Barbora Strycova who will play Misaki Doi in the first round. Neither are in great form – Strycova has lost her last three matches, granted all three to quality players, but in general, she seems to have stalled a tad in singles. A slumping, Doi has lost six of her last eight matches on tour and hasn’t beaten a top 100 player since May. The winner of this match will play Jennifer Brady or Andrea Petkovic in the second round, which has third set tiebreak written all over it. Snap Thoughts: This section is wideeeee open. Strycova has generally been quite consistent, but perhaps not so reliable in the last few months. Mladenovic should waltz this section on her potential, but there’s not a sense that she’s going to take advantage of it with her recent form. I’m guessing all the tennis in the first half of the year has caught up with her. I could totally see a surprise name reaching the last 16. The two seeds in this section, the number 10 seed, Agnieszka Radwanska and the number 20 seed, CoCo Vandeweghe both face tricky openers – Radwanska gets Petra Martic, while Vandeweghe plays fellow compatriot, Alison Riske. Martic has reached the fourth round at the last two Slams as a qualifier and this time, managed to get into the main draw by ranking. Compared to the first half of the year, Radwanska’s form has picked up during the US summer hard court season. However, she has still looked vulnerable at times, missing a spark, and her recent losses have mostly been one-sided. The winner of Radwanska-Martic gets either Yulia Putintseva or the 17-year-old qualifier, Sofya Zhuk, who is playing her first ever main draw at a Slam. 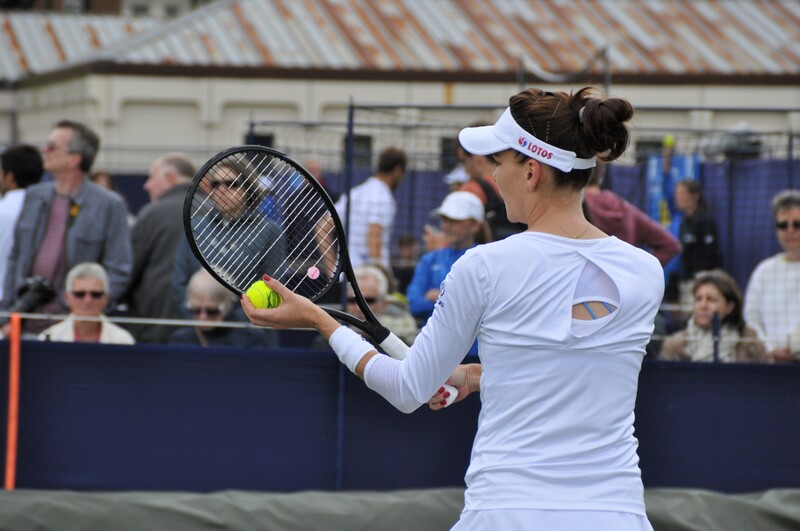 Vandeweghe snapped a three match losing streak to Riske at Wimbledon yet it remains a closely fought match-up with the pair splitting their eight previous encounters. Vandeweghe has lost her last three matches on tour – two of them were against good friend, Madison Keys. The faster courts in New York should suit CoCo’s game. The enigmatic, Ons Jabeur potentially looms in the second round. Snap Thoughts: Radwanska-Martic is an upset alert, even if Martic hasn’t played a great deal of tennis since Wimbledon. It’s the kind of match-up you’d expect Radwanska to have won comfortably a few years ago, yet nowadays may be vulnerable and particularly on this fast surface. Former US Open champion, Svetlana Kuznetsova will play Marketa Vondrousova in the first round. While a potentially tricky match-up on paper since Vondrousova has been a winning machine this year (50 wins in 2017! ), the Czech player hasn’t played since winning an ITF on clay in Prague at the end of July. A trio of talented players could rock the boat in this section with Anett Kontaveit, Lucie Safarova and Cici Bellis all present. Perhaps surprisingly, it’s Kontaveit who is the seed, which is a testament to what a great year she has had. The seeding hasn’t necessarily helped her out as she plays Safarova in a first-time match-up. The winner will play Bellis or Nao Hibino in the second round. The American, Bellis has scored 13 top 50 wins in 2017 and has often responded positively with a decent home crowd. Snap Thoughts: The Kontaveit-Safarova-Bellis section is brutal and i’m gutted they are all lumped together in this section as i’d have them all as contenders to reach the second week. This is a pretty tough draw for Kuznetsova, yet she’s generally been quite reliable at getting through her early matches of tournaments. The number four seed, Elina Svitolina will be seeking to reach the last 16 of the US Open for the first time in her career. If recent form is anything to go by then this will be her best shot at achieving that feat – winning her third Premier 5 tournament of the year in Toronto, the Ukrainian player put together a brilliant title run that included four top ten wins. Svitolina will play Katerina Siniakova in the first round of the US Open. The Czech player certainly has the weapons to disturb Svitolina, but comes up second best right now in terms of mental toughness and staying calm in the crux moments. The winner will play Evgeniya Rodina or Eugenie Bouchard – note that Svitolina has won all five previous meetings against Bouchard. Their careers have gone in opposite directions since they played out a very entertaining final in Kuala Lumpur last year. Svitolina is seeded to meet New Haven finalist and number 25 seed, Daria Gavrilova in the third round. The Aussie is enjoying a great week at the Connecticut Open where she is into her second final of the year after Strasbourg and again, the week before a Slam. Sadly, this hasn’t translated into Slam success for Gavrilova so far this year with two brutal first round losses at the last Slams, being edged out in tight three setters to Elise Mertens (6-7(1) 6-1 4-6, RG) and Petra Martic (4-6 6-2 8-10, Wimby). Gavrilova’s first round opponent is the qualifier, Allie Kiick – it’s wonderful to see Kiick qualify who has fought and overcome so many battles off the court. The winner of Gavrilova-Kiick will play either Shelby Rogers or Kayla Day. Snap Thoughts: Svitolina has to be up there in terms of contenders for the title. My only concern is she has the potential to get hit off the court by a big hitter as they pretty speedy. However, I do admire her resilience and she’s definitely looked to be more aggressive this year. I like this draw for Gavrilova to snap out of her recent funk at Slams. After reaching the fourth round of the last two Opens, Madison Keys will be going for third time lucky to break into the quarter-finals in New York. Recent form including a title in Stanford suggests she could be primed for a big run. Perhaps most important of all is that the American seems to be building momentum and moving past her recent wrist woes. While she has been bothered by her forearm this summer, this seems to be a minor compliant in comparison to what she has been through during the last year or so. The number 15 seed, Keys has a tough opener against Elise Mertens. The Belgian player is enjoying her breakout year on tour and will crack the world’s top 40 in next week’s ranking after a semi-final run in New Haven. Keys is seeded to meet the number 17 seed, Elena Vesnina in the third round, who plays Anna Blinkova for the second consecutive Slam. Vesnina beat Blinkova in the first round of Wimbledon, 6-4 5-7 6-2. The 18-year-old, Blinkova is definitely a name to watch out for as she has successfully qualified for three of the four Slams this year, only falling short at the French Open where she lost in the final round of qualifying to the red-hot, Vondrousova. Expect the unexpected with a section headlined by the number 15 and 19 seeds, Jelena Ostapenko and Anastasia Pavlyuchenkova respectively. The French Open champion, Ostapenko, backed up her Slam triumph in style at Wimbledon with a quarter-final appearance, but has since had a first wobble with first round losses to Varvara Lepchenko and Aleksandra Krunic in Toronto and Cincy respectively where her serve looked increasingly suspect. Pavlyuchenkova won back-to-back matches for the first time since May in reaching the quarter-finals of New Haven. The talent has never been doubted with Pavs, yet her lack of consistency and focus always seems to thwart her. First up in New York will be a repeat opener from New Haven against Christina McHale – Pavlyuchenkova rallied from a set down to beat McHale, 3-6 6-2 6-4 last week. While on the topic of repeat match-ups, Daria Kasatkina and Wang Qiang will reprise their first round match from last year’s US Open with the winner to play Pavlyuchenkova or McHale in the second round. Snap Thoughts: Anything could happen in this section – not even a feeling to how Ostapenko will get on although the courts should help her out. I could put a case for six of the players in this section reaching the fourth round. Blockbuster match-up alert – the number six seed, Angelique Kerber opens the defence of her US Open title against Naomi Osaka. The Japanese player hasn’t perhaps pushed on in 2017 as many may have predicted. Still, there have been flashes of brilliance in between momentum-stalling injuries. Osaka had the world number one, Karolina Pliskova on the ropes for a time in Toronto where she won five matches at the same tournament for the first time in 2017. Sadly, and not for the first time this year, she was bothered by an abdominal injury and was forced to retire early on in the third set. Kerber won just one match through the Toronto-Cincy double although losses to the resurgent pair of Sloane Stephens and Ekaterina Makarova were not terrible losses. The most recent defeat to Makarova would have stung though having missed a match point against a physically ailing opponent in one of the most dramatic matches of the year. 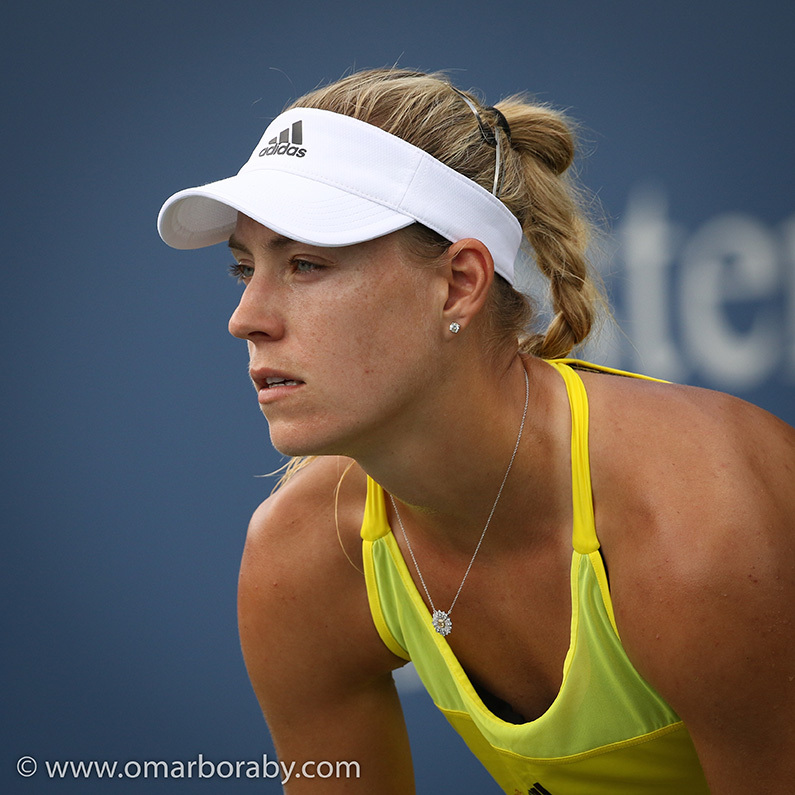 Kerber was noticeably more aggressive, yet seemed to lose focus at times in the decider. Kerber is seeded to meet Lesia Tsurenko in the third round. This time last year at the US Open, Tsurenko enjoyed her best career result at a Slam, outlasting Dominika Cibulkova in a brutal third rounder. A heads up for a blast from the past with the qualifier, Kaia Kanepi and Francesca Schiavone meeting in the first round. Following numerous injuries, this will be Kanepi’s first main draw match at WTA level since Rabat last year. Snap Thoughts: Kerber-Osaka could be a cracker! I’m fascinated to see how far Kerber goes in this draw. If she plays to a half-decent level then I think she could actually go pretty deep. Returning to her most successful Slam, the number five seed, Caroline Wozniacki plays the qualifier, Mihaela Buzarnescu in the first round of the US Open. If she were to win that opener, Wozniacki would play either Mona Barthel or Ekaterina Makarova in the second round – the latter is one of the most dangerous unseeded players in this draw. Makarova has gone on a tear during the US summer hard court season, winning a total of nine matches and looking almost a different player after winning her first title in over three years at Washington. Despite the obvious dangers, Wozniacki has a combined 10-0 head-to-head record against Makarova and Barthel. Wozniacki’s projected third round opponent will be the winner of a ball-blasting, helmets-at-the-ready first rounder between the number 29 seed, Mirjana Lucic-Baroni and Monica Puig. Neither have been enjoying the most fruitful of times on the tour of late – Puig hasn’t won back-to-back main draw matches since February, while Lucic-Baroni has been bothered by a shoulder injury and has won only one of her last eight matches. Granted, that lone win came just last week in New Haven, an impressive three set win over Anett Kontaveit. The winner of Lucic-Baroni vs. Puig will get either Carla Suárez Navarro or Ipek Soylu in the second round. Snap Thoughts: A tough draw for Wozniacki, yet i’d still take her to reach at least the second week. In fact, i’d favour the counter-punchers in this section with Suárez Navarro playing well enough to tame either Puig or Lucic-Baroni, who have both been highly erratic in recent months. With one of the best Slam records on the WTA in the past two years, Venus Williams is never one to discount at a Slam. Venus has reached at least the second week of her last five Slams and has reached two finals this year, coming up second best against Serena Williams and Garbiñe Muguruza at the Australian Open and Wimbledon respectively. 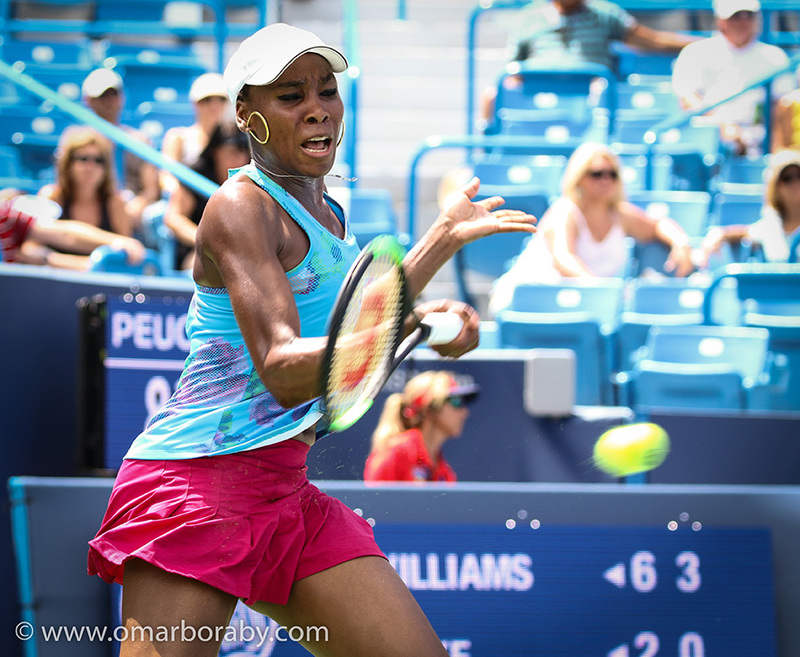 First up for Venus at the US Open will be a classic match-up between experience and youth as she takes on the 19-year-old qualifier, Viktoria Kuzmova, who will be playing her first Slam main draw. There’s not a great deal to elaborate on in this section with the number 24 seed, Kiki Bertens, the other seed and not likely to pose a huge threat having won just one match during the summer hard court season. An intense, Maria Sakkari could be a challenging opener for Bertens, who relies heavily on confidence and form. Snap Thoughts: On paper, it is a very inviting draw for Venus to maintain her stunning record of reaching the second week of recent Slams. So much has happened since Petra Kvitova and Jelena Jankovic last played each other on tour. Back in 2015, Jankovic stunned the defending champ at Wimbledon with a three set victory on Centre Court. The pair are set to meet in the first round of the US Open. Kvitova won one match each at Toronto and Cincy, scoring quality top 50 wins over Anett Kontaveit and Carla Suárez Navarro. The last few weeks haven’t been so successful for Petra in terms of results, but she keeps plugging away. Recent pictures released of her hand after the attack (in Czech media, you can find them if you try hard enough) have reset the expectations once again and remind us that for Petra to be playing tennis again is simply extraordinary. Jankovic has endured a terrible year and dropped to number 70 in the rankings a few weeks ago, her lowest ranking in over 13 years. The Serb hasn’t played since Washington, pulling the plug in her opener against Oceane Dodin due to a back injury. Therefore, the number 13 seed, Kvitova will go in as a heavy favourite. The winner of Kvitova-Jankovic gets either Alizé Cornet or Heather Watson. The other seed in this section is the number 18 seed, Caroline Garcia, who has had her most successful year to date, reaching the second week at the last two Slams. The Frenchwoman will need to overcome a recent loss to Tereza Martincova in Gstaad to get her campaign rolling. Snap Thoughts: My expectations for Petra remain relatively low although the weather forecast in New York doesn’t look to be as hot as last year! I like Garcia’s draw and with her new-found reliability, she could be one to watch. Garbiñe Muguruza is flying high – building on her second Slam title at Wimbledon, the Spaniard posted a trio of deep runs in Stanford, Toronto and Cincy, topped off with a title at the latter including a resounding 6-1 6-0 triumph in the final over Simona Halep. Muguruza heads into New York with a big bucket load of confidence, which she will need since she has never made it past the second round of the US Open in four previous appearances. Muguruza will play Varvara Lepchenko in the first round, followed by either the Wimbledon Girls champion, Claire Liu or Duan Ying-Ying. Muguruza could be set for a Wimbledon semi-final rematch against Magdalena Rybarikova in the third round. Rybarikova nabbed one of the final seedings, a rather spectacular feat considering she was in qualifying for her last three tournaments. The Slovak player hasn’t really translated her grass-court form onto hard courts, failing to qualify for all three events (Note – she got a lucky loser into the Toronto main draw where she reached the second round). For the second time in a month, Rybarikova will play Camila Giorgi in her US Open opener. The Italian player won their most recent encounter in qualifying in Cincy, 6-3 6-4. Snap Thoughts: I’m not bothered by Muguruza’s lack of success in New York – it feels like she is in a great place mentally and my hunch is that she will break new ground and reach at least the second week. Johanna Konta and Julia Goerges are the two seeds and the stand-out names from the 13th section. The number seven seed, Konta gets Aleksandra Krunic in the first round, which could have its moments – Krunic beat Jelena Ostapenko in Cincy and reached the second week at the US Open back in 2014 where she beat Madison Keys and Petra Kvitova, before giving Victoria Azarenka a run for her money in the fourth round. The Brit was solid during the Toronto-Cincy double, without making any significant ripples, losing out to two very respectable opponents in Ekaterina Makarova and Simona Halep. The number 30 seed, Goerges plays Annika Beck in the first round of the US Open. Beck sneaked into the main draw by virtue of Victoria Azarenka’s withdrawal. Surprisingly, Goerges and Beck have never played each other before. Based on recent form, Goerges will be the heavy favourite – Goerges has won 15 of her last 22 matches including three finals on three different surfaces, while Beck has lost her last five matches in straight sets and hasn’t beaten a top 100 player in a completed match since coming from behind to defeat Eugenie Bouchard at Indian Wells. The winner of Goerges-Beck will play Zheng Saisai or Alison Van Uytvanck in the second round. Snap Thoughts: Konta-Goerges could be a fabulous third rounder and i’d fancy it to happen based on the draw. Konta may even sneak under the radar after all the attention at Wimbledon and having not enjoyed stand-out results since then. Still, her level has looked decent and this isn’t a bad draw at all. Winning three matches at the same tournament for the first time in 2017, the New Haven finalist and number 11 seed, Dominika Cibulkova, will take a huge slice of confidence into New York. First up for Cibulkova will be fellow compatriot, Jana Cepelova. The winner will then play either Sloane Stephens or Roberta Vinci in what is an attractive opening clash. Stephens returned to action at Wimbledon following a year on the sidelines due to a serious foot injury. Her success on the comeback has been surprisingly rapid after reaching the semi-finals of both Toronto and Cincy and picking up eight top 50 wins along the way. 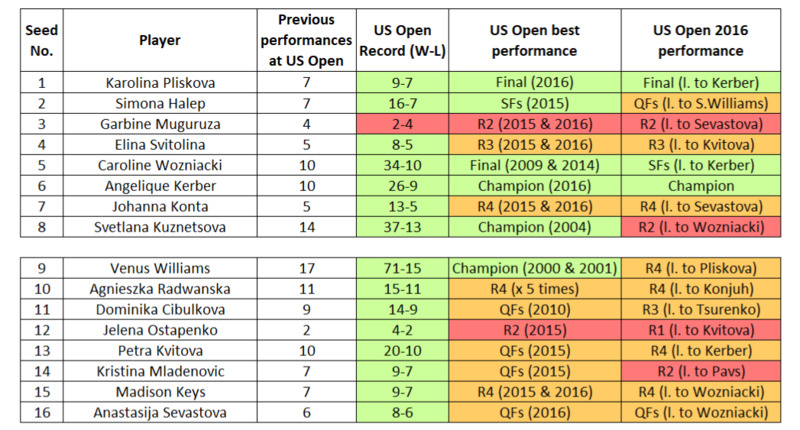 Vinci’s recent form has been disappointing (won one of last six matches) but she’s never to be discounted at the US Open. The Italian player reached the final in 2015 thanks to *that* semi-final win over Serena Williams and she backed it up impressively in 2016 with her fourth quarter-final appearance at the US Open in the last five years. This is a fun section as one of last year’s quarter-finalists and number 21 seed, Ana Konjuh gets Ashleigh Barty in the first round. Konjuh’s season has had its fair share of peaks and troughs and she arrives in New York on a three match losing streak. Barty meanwhile won five matches apiece at Toronto and Cincy, reaching the third round at both tournaments as a qualifier. The pair will meet for the first time on the tour. Snap Thoughts: A rejuvenated Cibulkova could be an exciting addition in this section. While her form has been stunning in recent weeks, my expectations for Stephens are somewhat tempered and i’m not sure why, just a feeling. I’d love to see an Acapulco final rematch between Cibulkova and Stephens in the second round. Barty’s consistency in recent weeks put her up there as one of the favourites to get out of this section. The penultimate section of the draw is arguably one of the most open, headlined by last year’s US Open quarter-finalist and number 16 seed, Anastasija Sevastova and former US Open semi-finalist and number 22 seed, Peng Shuai. 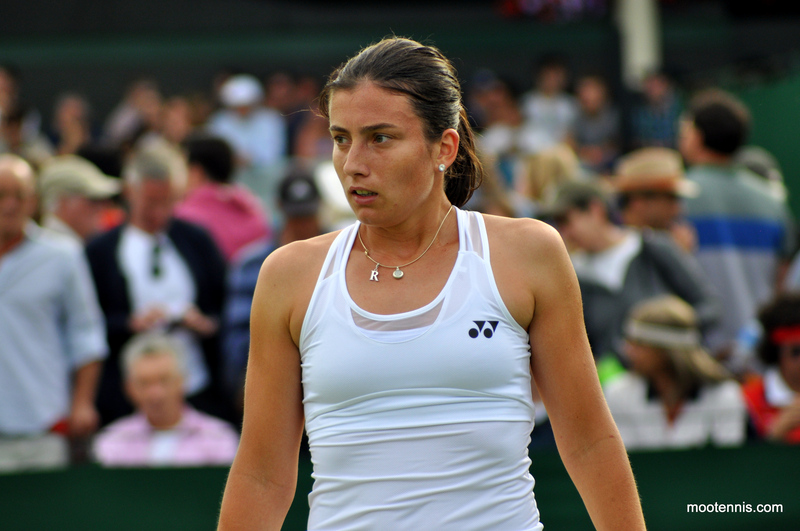 With Sevastova, you can never quite be sure whether she will be passive and fraught with nerves, or tactically superb and solid as a rock – there have been examples of both this year. Sevastova will play Carina Witthoeft in the first round who has a low-key excellent record at Slams. The German player has reached the third round at four of the last five Slams. Peng is having a superb year, winning her 32nd and 33rd matches of the year to reach the quarter-finals in New Haven. However, there has to be a concern over a heavily taped knee, which has seemed to be an issue since she won her second WTA title in Nanchang last month. The trio of Irina-Camelia Begu, Donna Vekic or Beatriz Haddad Maia are all within this section with the latter pair meeting in the first round – Vekic and Haddad Maia are both at career best rankings following great years and should come together for a very enticing first round clash. Snap Thoughts: I’d tag Sevastova-Witthoeft as an upset alert as I think Sevastova may feel some pressure and expectation with QF points to defend. If it weren’t for the knee, i’d have no hesitation in picking Peng to come through this section. Last, but by no means least, the 16th section of the 2017 US Open draw is headlined by an absolutely barnstorming first rounder between the number two seed, Simona Halep and 2006 US Open champion, Maria Sharapova. I was a bit late in finding out the draw so was able to scroll through it all at once – it didn’t hit me until I got very close to the end that Sharapova hadn’t been drawn yet… 😲😲😲 . There will be a dedicated preview to Halep-Sharapova to come on Moo’s Tennis Blog later this weekend so I won’t go into too much detail for this one yet. All i’ll say is that I hope Sharapova is going to be fit enough to play because this could be 🔥🔥🔥. Aside from Halep-Sharapova, it’s a pretty quiet section of the draw. Lauren Davis, who has lost her last six matches on tour, is the number 32 seed, while the only remaining player in this section to have reached the third round in New York is Timea Babos who has had a challenging year, winning just five matches since Indian Wells. Snap Thoughts: The Halep-Sharapova match will be HUGE since this is one of the weakest sections of the draw. If Halep were to get past Sharapova then her reward would be a pretty dreamy draw to the quarters. Who do you think will win US Open? Have your say in the tournament poll and as always, comments are appreciated! August 26, 2017 in Tournament Preview, US Open, WTA. I hope that Sharapova” s wild cards era will end here. And I also hope Simona Halep will beat her, because I strongly believe that Maria does not deserve this wild card. I don’t see Muguruza winning, personally. She doesn’t have the greatest record on quick hard courts, she tends to find it harder to get into good positions to take good cuts at the ball. 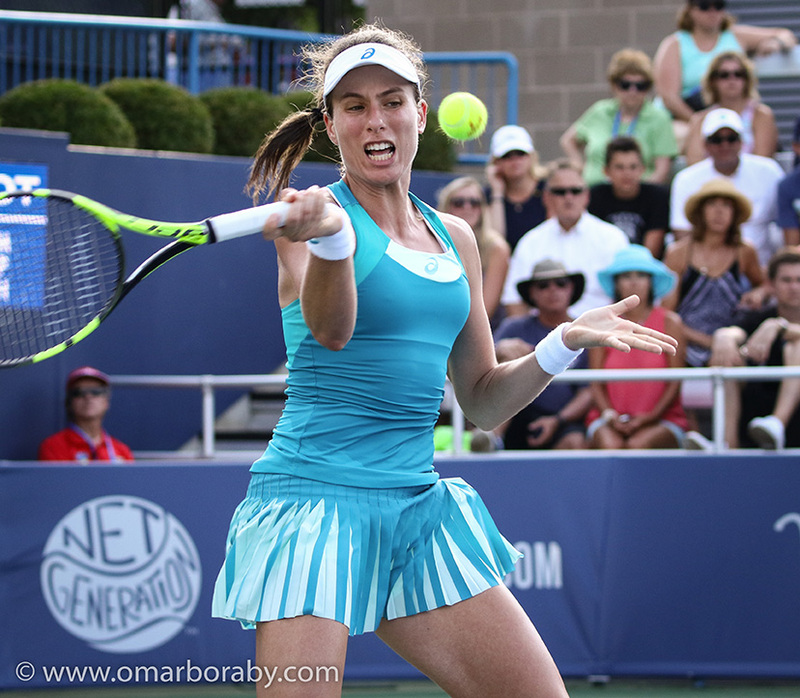 Sorry to Garbine voters, but I’m also not getting Slam title vibes here even though I really like her new found form. It will be someone else. I will still cheer her on. +1 to you both. I think Muguruza will make the second week of the US but I don’t think she will win. I don’t know why, going on one of my feelings again! Halep. Sharapova is a better player than all the other in-form floaters and showed that she is able to produce a high level after a longer period of time (if she is healthy). Yay!! Another Petra smiley photo from Bourne 2014, keep em coming James!! AO 2018 confirmed? This means you’ll complete the Career Slam!! That’s impressive James, you’ve clearly put a lot of work into this preview! I hope Domi does well but wouldn’t underestimate her first round opponent Jana Cepelova, who despite her lowly ranking is notorious for causing upsets (she’s the only player I can think of who has a positive record against Serena, played and won once). If she gets past Jana, I think she’s got an excellent chance of making the second week at least; her recent form’s been very encouraging. I keep expecting Angie to wake up again and go for a deep run in a tournament, and this could be the time she does it, maybe as far as the semis (I don’t expect her to win again). I expect Woz to do well again, maybe all the way to the final which she’s reached before. Elina Svitolina should do well too, maybe the semis. To win the whole thing; the power players seem to be winning the biggest titles at the moment, so either Venus (if she’s feeling fit), Karo Pliskova or Madi Keys could win it with Jo Konta in with a shout too if she hits her best form. CoCo could make a deep run too though she’s seemed a bit shaky recently, especially against Aga. I don’t think Maria’s ready yet to go all the way in a slam again although she’ll probably make a deep run (maybe the quarters) if she gets past Simona in the first round. Thanks, Graham. Last Slam of the year and the final push for me before a couple of weeks off at the end of the US so went all in with the preview! Agree with everything you’ve said. I’ve gone for Konta as my champ. LOL I was gonna say Krunic could give Konta a battle but I haven’t watched her play in a while so thought twice. Think I am going with Wozniacki to win. I have been saying for a while that she is losing all these finals as the one she is going to win a significant one. Perfectly in line with WTA logic – would be great if she finally does it! My partner is actually in New York while the open is on. He’s not going to watch any though, he’d rather go see Ru Paul haha! I dunno… I’m struggling to get really excited for this one what with Djokovic and Serena both being out of action.